1. Stir together the miso, mirin,sugar and sake. Place the salmon Fillet in a medium food bag, cover with the miso marinade. Leave in the fridge for at least an hour, or better still, overnight. 2. Heat oven to 200C/fan forced. Lightly oil a baking tray. Use Kitchen paper to wipe off the marinade. Place the fillet on the baking tray,skin side down. Cook in the oven for 15mins unit the fish flakes easily and is cooked through. 3. Meanwhile, make the cucumber salad. Using a vegetable peeler,shave the cucumber into long thin ribbons. Whisk together the rice wine vinegar, oil and sugar. Toss the cucumber ribbons into the dressing,then curl them up on two plates. 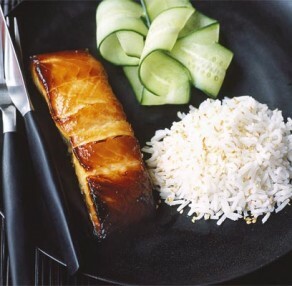 Serve the salmon and some plain white rice sprinkled with toasted sesame seeds.